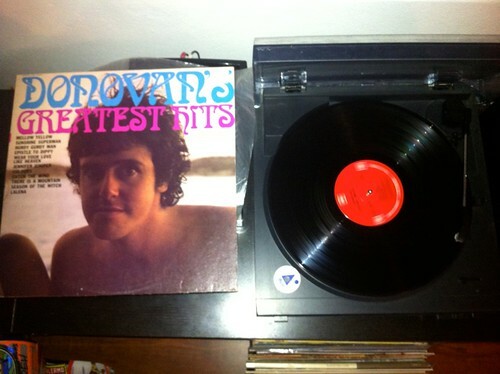 Continuous Hit Music – a weekly exploration of vinyl finds in 2012. Read ‘em all here. This record was happily sitting in a bargain bin at Rozelle St Vinnies. Most St Vinnies seem to have a box of records somewhere, usually for a dollar or two. There’s really about a 1 in 3 chance to actually find something good amongst the battered old soundtracks and forgotten country compilations. So, to find one of my favourite albums for $2 randomly is quite a find. Ram. The only album credited to Paul & Linda McCartney. I know it’s weird to say, but it’s my favourite album that Paul McCartney was ever involved in, and by default my favourite album involving any Beatle. It gets a lot of flack because, I guess, people hate Linda. But I love Linda. And I love how in love with her Paul was. And I love this album that they made. 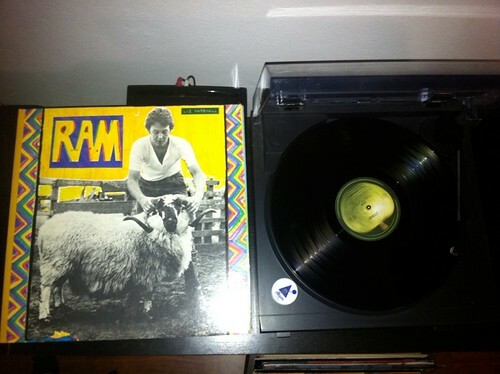 Ram was the first album McCartney made after he left the Beatles (his first solo album was made in a weird period when he was still technically a Beatle). To escape from it all, they moved to their Scottish farm, and made this rustic, sweet down home recordings. The big people’s anthems that Lennon wrote were missing here, this was a small scale record. Another reason it is hated, I guess. But the songs are just so sweet. McCartney’s sense of melody is on top form. The yearning “Dear Boy”, the little uke & voice ditty of “Ram On” – all very simple but very beautiful. The biggest thing approaching an anthem was the two part “Uncle Albert/Admiral Halsey”, even that has that has McCartney making phone ringing noises with his mouth. Not really “Imagine” then. The legend looms large for me. Most of my love for Paul and Linda together comes from this period. Hiding away on their farm, experimenting with sounds, no doubt wearing awesome sweaters, making music for the fun of it. People say Yoko broke up the Beatles, but I think Paul only had the strength to leave that band because he had Linda. And Linda was an extraordinary woman, if not much of singer. She is McCartney’s muse, and that alone makes her more important to the story of popular music than all but three people ever. I can listen to this album all day. And it ends on one of McCartney’s absolute best songs – “The Back Seat Of My Car”. It’s got those Pet Sounds chords and sadness, and the story is of two young lovers running away to be together. Not only is it a great song for everyone, I imagine Paul and Linda, both about to hit 30, living like they are teens again. They sound so young, so in love, so invigorated. Macca makes great music to this day, but I keep going back to Ram. And maybe it’s age on my part too. “Imagine” sounds silly to me now. And I get less impressed by big production as the years go on. Something down home and lovely will do. My copy has a tag taped to it, declaring this album as belonging to ‘Liz Marshall’. She took very good care of it – it doesn’t skip and sounds great. I assume Liz was the first owner, and I don’t know how it ended up in Rozelle St Vinnies. But thank you Liz for passing your copy of this wonderful album on. You’ll be glad to know it’s found a loving home. Markets. More than ever, they seem to be the place to pick up the odd record. Records have deeply fallen in with the vintage crowd. And Rozelle markets, a medium sized affair, has three or four dedicated record stalls. And then some of the stalls have a random pile of records in the corner somewhere too. There’s a lot of these guys doing the rounds. Some have eBay stalls as well. But I see the same faces and the same records at some of these stalls. One guy in particular has been trying to flog off a Easybeats compilation with a great sleeve but horrible scratches at about four markets I’ve been to. Maybe if I get to these markets earlier there would be a better selection. But I doubt these guys dig out their finest stuff for the markets. What they do have a lot of is mid-level finds. And I can never have more mid-level finds. Despite Sony’s work in recent years, Darkness At the Edge of Town is not one of Springsteen’s more famous albums. It doesn’t have any of his big radio singles. No ‘Born To Run’, ‘Born In the USA’, ‘Dancing In the Dark’, ‘Hungry Heart’ etc. For a casual fan, looking at the tracklisting might lead them elsewhere. In fact, it is kind of an unassuming album. Born To Run (1975), which came before this, was a revival of a dying career. A dramatic, commercial turn. The River (1980) that came after, was the ambitious double. Every album after has been an event. Where as Darkness came out after a long (and well documented elsewhere) break, and on the surface, offered more of the same. I am a Springsteen fan. So I love this record. What it lacks in the big story, Springsteen offers us some of his finest songs. It’s his vision unencumbered by making some bigger point. That said, ‘The Promised Land‘ is probably a big an anthem as he’s ever made. But my personal favourites are the more tender moments, like ‘Racing In the Street‘. Sony reissued Darkness a couple of years ago in a lovely book form. There are plenty of reviews online to read if you want to decide for yourself. If you’ve not heard much Springsteen before and are keen to, I wouldn’t start here. I would go with Born To Run. 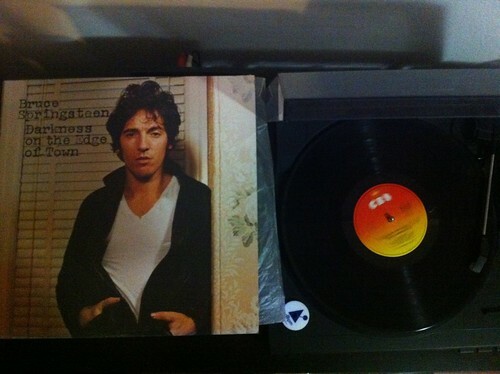 Interestingly enough, this is my first Springsteen album on vinyl. I always see the stuff around, I guess because they made so much of it. It’s so regular I figured I’d get around to it one day. Good thing about this blog project that that day is now. One final thought on this album – one that has always bugged me. The album cover is terrible. In the middle of a run of iconic album covers, he doesn’t even look like he thought about this one. The back cover is pretty much the same photo without the jacket. Who thought of this? Anyway, another reason this album is just short of a classic. Firstly – Jelly Sounds. I have no idea who these guys are, and many of my vinyl mates have not heard of it either. Based out of Queensland, it is the best stocked and cheapest new vinyl site I can find. Even the shipping is cheap. They are cheaper than almost every Australian eBay seller I can find. Reliable, quick, and a great selection. And they stocked this record, Anodyne. For a few years it was my favourite album of all time. It is still well and truly up there. Rhino finally put out a excellent vinyl edition in 2010. I’m not even sure it ever came out on vinyl the first time around. The story of this album is all over the internet. It is, along with maybe Son Volt’s Trace, the high watermark of this genre that came to be known as alt-country. It’s beautiful. It rocks. It has Doug Sahm. Most importantly, it is the last word on one of the greatest somgwriting partnerships of all rock. The riches of music that came from the bands that followed – Wilco and Son Volt – started here. In a pub in London with a new super-boss, he asked the entire team what our favourite albums were. A highly inappropriate question, I think. I said it was Wilco’s Being There (still true, I guess). 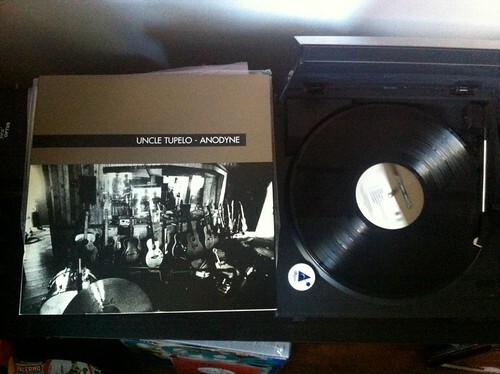 Michael commented that it would either be that or Uncle Tupelo, depending on how obscure I wanted to get. The album has dated extremely well. So many bands still want to sound like this. Jay Farrar’s songs in particular hold up. Full of mystery and sadness, they still reveal new secrets almost 20 years later. It’s his use of words that is his greatest power. The album was called Anodyne for god’s sake. Not a popular word in popular music. It is one of maybe 20 albums where I know all the chords and lyrics to. I played many of these songs in teenaged bands. Forcing people to learn them. I learnt harmonies listening to ‘New Madrid’. This record is a very big part of me. It is a thrill to finally have it on vinyl. It’s a big gatefold record, and a nice quality pressing. It has been treated with priority care, like a new Wilco record. If you’ve not heard Uncle Tupelo, or the rich well of ‘alt-country’ records that came before 2000, then this is the place to start. May it lead you to the Old 97’s, the Jayhawks, the Bottle Rockets, Slobberbone and all that. When Wilco first toured Australia, I got to meet them, and we discussed Tupelo. Jeff said they couldn’t play the songs because Glenn, then the new drummer, didn’t know them. But Glenn said he would learn them if he had time. And yup, next show, they kicked into two songs from this album – ‘New Madrid‘ and ‘We’ve Been Had‘. I’ll never lose that memory.